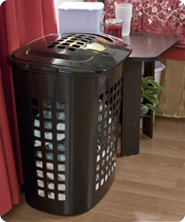 The 2.3 Bushel Lift-Top Laundry Hamper offers an extra large capacity, making it ideal for family use in the laundry room, bedroom or bathroom. The hamper features a lift-top lid that contains and conceals clothes stored inside. Handles integrated into the sides of the base allow for easy and comfortable lifting and transporting within the laundry room. It's durable construction and reinforced rim are designed to hold up to regular day-to-day use. Large ventilation holes help reduce excessive odor and allow for amble ventilation. The smooth plastic interior is snag proof and easy to clean. 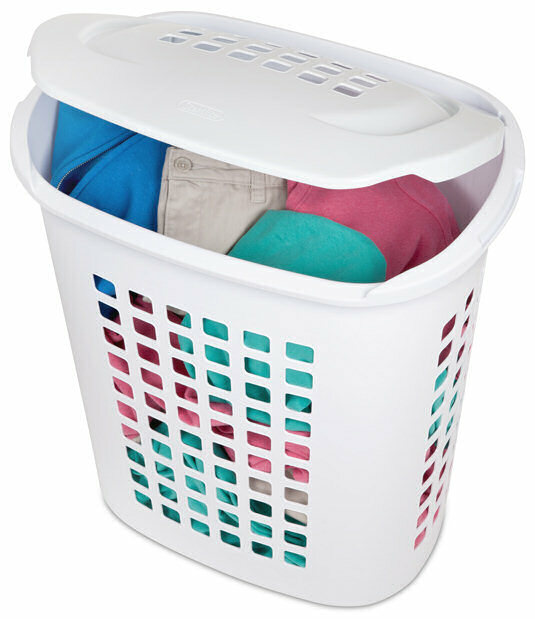 The overall dimensions of this item are 22 1/4" L x 15 1/2" W x 24 5/8" H.
Overall Assembled Size: 22 1/4" x 15 1/2" x 24 5/8"
Use different colored hampers to easily sort loads of laundry. Ideal for family use in the laundry room, bedroom or bathroom. 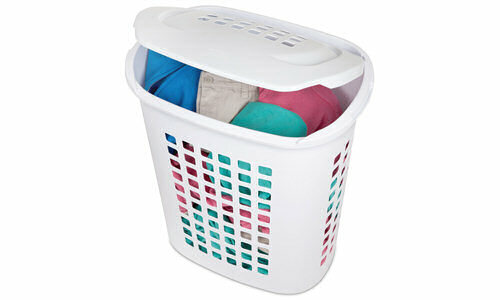 2.3 Bushel Lift-Top Laundry Hamper is rated 3.9 out of 5 by 9. Rated 5 out of 5 by chellester from 23 Bushel Lift-Top Laundry Hamper With 2 sons that play sports & a husband that works outside, I need a big laundry hamper for our bathroom. Thanks to Sterilite, I have the perfect solution! 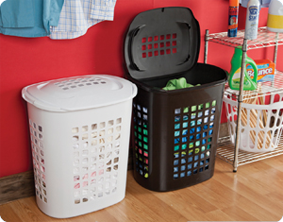 The 23 Bushel Lift-Top Laundry Hamper is perfect sized for our family! It is sturdy & holds all the clothes until I am ready to do the laundry. I have used Sterilite hampers for years, and this one is one of my favorites! I love it & wanted to say thanks to Sterilite for another great product! Yes, I recommend this product. Rated 2 out of 5 by Panther from 50/50 I have two of these baskets. One is going strong, the other broke at the "seam" of the rim where the handles are. If you look or feel around the rim, you'll find a seam in the rim. One handle broke after a month. Then as I tried to use the rim near the handle area and more broke off right on the seam line. So after 5 month, the hamper is down to just the front of the rim existing and I'm looking for a replacement. The other laundry basket we don't lift because I fear of the rim breaking. So we use the handles to just drag the hamper around. It's a nice sized hamper and I wished the quality was better. If it was better quality, we'd have 4 of these. Rated 5 out of 5 by myndseye711 from Great! I have had this forever. It is so durable, not sure it will ever break! To clean it, use a white erase pad. I would definitely recommend this-great investment! Rated 5 out of 5 by naturalista44 from Love the features! This is a high quality product. It fits my needs very well. The lift- top lid is very convenient. I like the durability and the size of this Sterlite laundry hamper. This is my most used Sterilite brand product. Rated 4 out of 5 by svwhy from Breathing room My family has 4 of these hampers and it seems they are always full! They are just the right size where it is not overwhelming to tote them up and down the stairs to the laundry room. All the hole allow air flow so if clothes sit for a couple of days they are still ok. Rated 4 out of 5 by Karen1 from This product holds laundry well, but the lid's attachment tips can break off. The basket certainly holds a lot of laundry and so serves that functional purpose well. However, there are two plastic tips that connect the lid to the actual basket which may break off leaving the lid unattached to the basket.